Have you always wanted a traditional fireplace but don't like the idea of maintaining one? Then the Dimplex Moorefield Electric Suite is perfect for you! The full fireplace suite will add a beautiful feature to any room in your home. It will become the centre of attention with its stylish, quality features which include a white stone effect surround, detailed logs, and life-like flames. The life-like Opti-Myst flame and smoke effect will give the sense of a real fire burning, but with no mess to clean up! The 3-dimensional feature is sure to create a realistic, relaxing atmosphere within the home. This electric suite has flame intensity control and you have the choice to enjoy the heat or turn it off when the flame effect and smoke feature is on. This fire insert has a 2kW fan heater that has two heat settings and a thermostat so you can set the ideal temperature for your home. It also features a remote control to make it even easier to use. 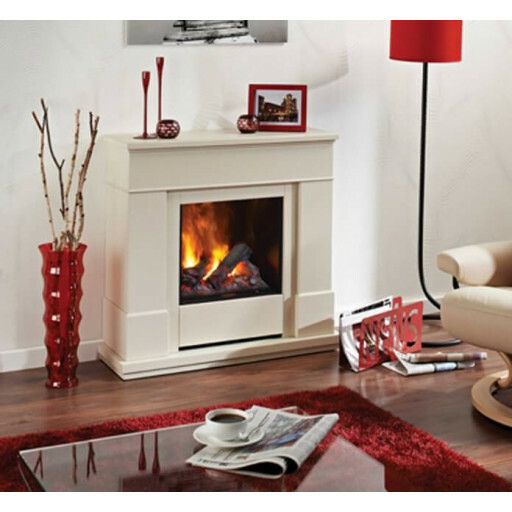 Make your home cosier and order the Dimplex Moorefield Electric Suite today! I only needed a small fireplace for my small apartment. This beauty was just the right size and the flame effect is amazing. I love it.